To the curious and inquisitive, who delight to study the “goodly frame of nature” and to know man both in his savage and civilized state, the traditions of barbarous nations and tribes are highly interesting and instructive. They make us acquainted with the vagaries of fancy, the train of reflection, the mode of reasoning, and the objects of religious adoration, common to minds unaided by the discoveries of science, the improvements of reason, and the advantages of revelation. Such minds, unable to comprehend the omnipotence and infinity of the Deity, and to trace the agency of second causes, have always evinced a remarkable and uniform inclination to people the universe with beings superior to man, but subordinate to the Great First Cause, whose business it is to superintend and direct the operations of nature. To this disposition of mankind we owe the spirits which impel the wind and rule the storm. The nymphs of lakes, rivers, and fountains; the genii of rocks, caverns, and mountains: even the angel, which presides over the last mortal agonies; and all the beautiful mythology, which teemed from the exuberant fancies of the Greeks, and of the eastern nations. The discoveries of modern science, and the daring experiments of a Franklin, have taught us, for instance, that thunder, the most sudden, sublime, and terrific of nature’s operations, which has shaken the hearts of the most powerful and naughty emperors, and which has generally been considered as the token of Divine Majesty incensed, proceeds from the amazing activity and the attractive properties of the electric fluid. But as the rude faculties of our ancestors could never make this important discovery, they solved the difficulty by arming Jupiter with the artillery of heaven. Now, as all the nations and tribes, which comprise the vast human family, are characterized from each other only by faint shades of difference, and as they have exercised the same powers of mind, and fallen into the same habits of reflection. We need not wonder to find an Indian Jupiter thundering in the New World, as the Grecian Jupiter did in the Old. To exemplify and confirm the preceding observations, we shall present your readers with an Indian tradition, which, we believe, is original, and which may afford a little amusement. Regretting, at the same time, that the literary part of our population should not inquire into the legendary stories of the Indian tribes, and communicate them to the public. An Indian of the Massasagua tribe, coming to my house last year during a thunder storm, and approaching the fire with a serious and apprehensive air, threw into it a piece of tobacco; upon which he fixed his eyes with great solemnity during the time it was burning, appearing to be engaged in mediation or prayer. This extraordinary waste of an article, of which I knew him to be excessively fond, excited my curiosity to know the cause that had produced it. Upon enquiry, he told me that the fumes of tobacco are grateful to the senses of that superior being, who, according to his belief, occasion thunder; and that the offering was made to deprecate his displeasure. Then going out, and again returning, after the storm, and together with it, his alarm had subsided, he asked me rather abruptly, whether I knew where Old Thunder dwelt. Startled at the question, I answered in the negative and expressed a wish that he would inform me. After exacting a promise that I would keep the secret, he consented to gratify my curiosity. Satisfying his scruples of conscience in this particular, he informed me that the abode of this mighty being, who is armed with so many terrors, was in a great cavern near the summit of a mountain. In the neighbourhood of the Great Lakes, many days journey towards the setting sun that the top of this mountain was perpetually covered with a dark cloud. Brightened every now and then by gleams of lightning; a circumstance which made it visible at a great distance, and that a rumbling noise, like that of thunder attempting to escape from its confinement, constantly issued from its recesses. 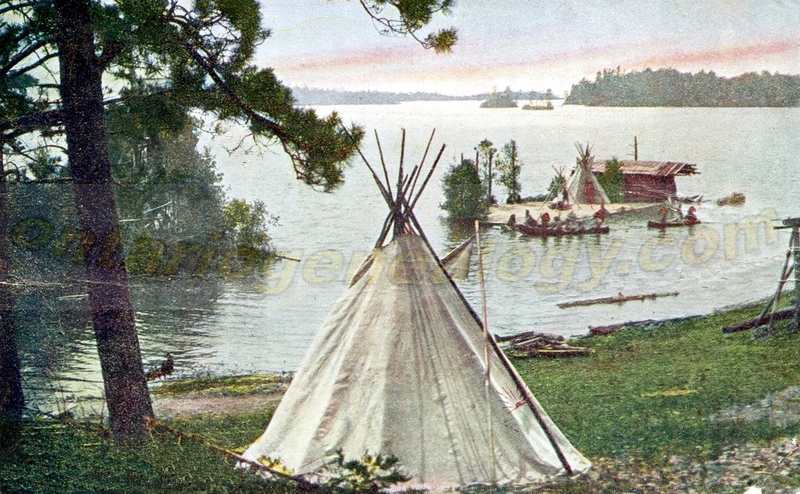 To confirm this belief he added that, in the time of the old Indians, many ages before the white man had crossed the Great Eastern Lake to settle in the country, a party of Indians, traversing the woods in search of game, and attracted by the unusual appearance of the mountains, had discovered this cavern. Upon entering it, they found that Old Thunder was absent, but that his children were at home. A bad or wicked Indian who happened to be of the party, wishing to gratify his malignant disposition, quarrelled with the children, and treated them with such insolence and rudeness that they wept bitterly. His companions, not being able to prevail upon him to desist from his violent and abusive language, carried him off and having proceeded to some distance from the mountain. They told him that old Thunder would not fail to punish him for the unprovoked insults, which he had offered to his children and that they must, in future, avoid his company, for fear of being considered as partners in his crime. No sooner had they uttered this reproof, than they saw black clouds from the top of the mountain gathering over their heads, and heard thunder rolling at a distance. Rightly supposing that old Thunder was approaching to avenge the wrongs done to his children, they forsook the wicked Indian, betook themselves to light with great haste and terror, and hid themselves in the thickest part of the forest. Darkness gathered round them, even the Great Spirit himself seemed to be angry, every succeeding gleam of lightning was more bright that the former. Each peal of thunder shook the ground below them; and each breath, which they drew, appeared to be their last. At length Thunder was silent, the clouds dispersed, and the sun appeared in the eastern sky. They then ventured to return to the spot where they had left the bad Indian, with a design to find out what had befallen him. Arriving at the place, they found him extended upon the ground, a blackened and lifeless corpse. Since that time thunder has been considered by the Indians as an object of terror and religious worship.